Camille Saint-Saëns , composer, pianist, organist and writer, was born on October 9, 1835 in Paris, France and died on December 16, 1921 in Algiers. Saint-Saëns was a child prodigy; he had perfect pitch, began piano lessons at age two and a half, and wrote his first piano piece at age three. The Clarinet Sonata, Op. 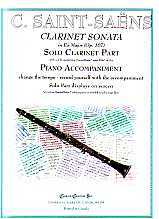 167, was the second of three sonatas for woodwinds (Op. 166 for Oboe and Op. 168 for Bassoon) and piano, written in 1921.